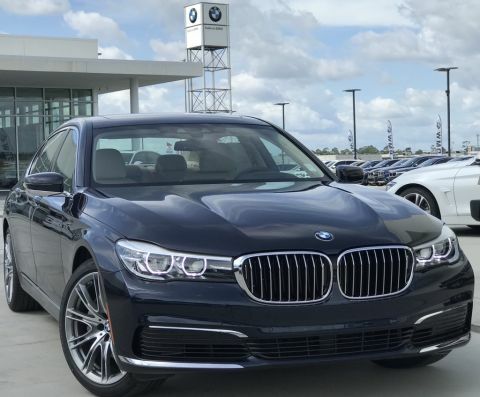 We like to refer to these vehicles as our "Boo-Boo" cars... this beautiful Certified 740i was originally purchased here at Galleria BMW by a local, Gulf Coast customer. Unfortunately, back in February '18 while driving on a back road just north of Biloxi, he came across a deer that happened to be crossing the road at just about the same time he was passing by. But don't worry, the deer survived and ran off (with a slight limp, mind you) but the 7 Series suffered a little bit of damage to the front end. The customer notified his insurance company immediately, and all repair work was performed by a local body shop and overseen by Galleria BMW. However, due to the fact the insurance company was involved, it did result in a blemish to the vehicle's Car Fax Report and as a result, we must price it accordingly. So if you're looking for am amazing car for an equally amazing deal and you're OK with the fact the vehicle had a previous "Boo-Boo" that been completely repaired, YOU JUST FOUND IT!! Beautiful Certified Pre-Owned BMW. CPO Warranty extends to 5 years/Unlimited Miles. YES!... UNLIMITED MILES!!! An incredible value priced well below NADA's Suggested Retail as well as the actual Market Average. Compare condition, mileage, equipment and price and you will realict thereze it will be hard to find a better overall package for your money. Great financing and extended warranties available thru BMW Financial Services. Certified. Jet Black 2017 BMW 7 Series 740i RWD 8-Speed Automatic 3.0L I6 DOHC 24V TwinPower Turbo LOW Miles! 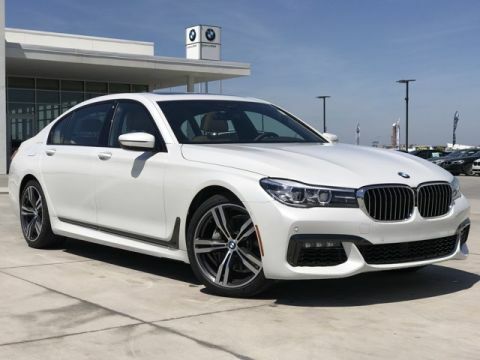 !, 740i, 4D Sedan, 3.0L I6 DOHC 24V TwinPower Turbo, 8-Speed Automatic, RWD, Black w/Dakota Leather Upholstery, 16 Speakers, 4-Wheel Disc Brakes, ABS brakes, Adaptive suspension, Air Conditioning, Alloy wheels, AM/FM radio: SiriusXM, Anti-whiplash front head restraints, Auto High-beam Headlights, Auto tilt-away steering wheel, Auto-dimming door mirrors, Auto-dimming Rear-View mirror, Auto-leveling suspension, Automatic temperature control, Brake assist, Bumpers: body-color, CD player, Cold Weather Package, Dakota Leather Upholstery, Delay-off headlights, Door auto-latch, Dual front impact airbags, Dual front side impact airbags, Electronic Stability Control, Emergency communication system, Exterior Parking Camera Rear, Four wheel independent suspension, Front & Rear Heated Seats, Front Bucket Seats, Front dual zone A/C, Front fog lights, Fully automatic headlights, Garage door transmitter, harman/kardon Surround Sound System, harman/kardon® Speakers, Head restraints memory, Heated door mirrors, Heated Front Seats, Heated Steering Wheel, Illuminated entry, Leather Shift Knob, Leather steering wheel, Lumbar Support, Memory seat, Navigation System, Occupant sensing airbag, Panic alarm, Power adjustable front head restraints, Power door mirrors, Power driver seat, Power Front Seats, Power moonroof, Power passenger seat, Power steering, Radio: AM/FM/HD w/In-Dash Single CD, Rain sensing wipers, Rear air conditioning, Rear dual zone A/C, Rear fog lights, Rear Window Blind, Remote keyless entry, Security system, Speed control, Speed-sensing steering, Speed-Sensitive Wipers, Steering wheel memory, Steering wheel mounted audio controls, Telescoping steering wheel, Tilt steering wheel, Traction control.